+ What is the best type of weatherstripping to use on my exterior residential doors? One of the best is our brush seal for the jambs and header, which is very easily installed, either with double face tape or screwed on. The brush material withstands over 1 million openings and closings. 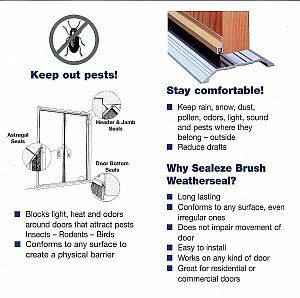 The door bottom can also be weatherstripped with a brush seal, or various other types of door bottoms available to you in our store. Check out our catalog for some of the different types available. + How do I seal the joints in my driveway ? The first thing to do is to clean out the joint - all previous filler material and debris. An important thing to remember is that the joint must be completely dry before you seal it, so do not clean it with water, vacuum it. Next, install a backer rod material which is usually 25% larger than the joint, so if the joint is deep, it will not fall through. The formula for the caulking material is that the depth should be 1/2 the width. It is important that the depth and width be correct, so that when the slab moves (for instance in a freeze/thaw cycle), the sealant bead remains intact. The most common sealant used is a polyurethane, limestone color. We have a complete line of all the material and tools you need to do your job. Email or call us for more information. + How can I protect my driveway, concrete porch, etc. from the damages of ice melters? One of our most popular products for that is Prosocos Saltguard. Please contact us for spec sheets, which gives you the rate of material to be applied and the instructions. + How can I stop water from leaking in the cracks in my basement walls? There are several different ways, depending on if it is a poured wall, a block wall, etc. One of our more popular products is a kit that will fix a seven foot crack, and can be installed by a novice if they follow the instructions. Please contact us for more information regarding this kit, or other solutions.